Visit the sunniest region of Italy, with its mild clima, the warming humanbeam and the wonderful towns full of history. You won't be able to forget these collection of photos. Visit the archeological site in the Valle dei Templi with its V century b.C. monuments. 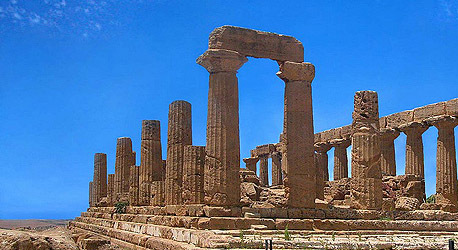 Discover the Agrigento's cathedral and Santo Spirito abbey. Walk along the beautiful beach, the cathedral and the city centre. Enjoy the amazing view from the top of the Rocca di Cefalù. Do you already know the Matrice church and the Venere castle with its wonderful Sicily's west coastline landscapes? Visit the amazing V century b.C. temple and the theatre. Discover the gorgeous beaches and the city centre of Taormina with the famous Greek theatre. Visit the Giardini di Naxos archeological site and the Gole di Alcantara.